In April this year, Maryam al-Otaibi, a 29-year-old year old woman in Saudi Arabia, was detained in prison without charge for 104 days after being reported to police by her family. Her transgression? Leaving the home of her abusive brother to live on her own in a new city. She is one of many Saudi women who make up the vanguard of the #IAmMyOwnGuardian campaign: a movement that has emerged over the past year and a half, pushing to end the male guardianship system in the Gulf Kingdom. 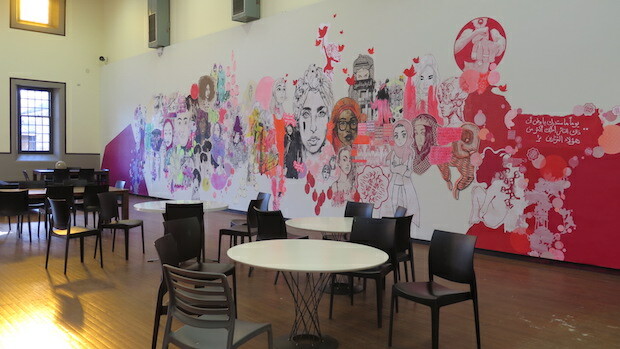 Now, Maryam’s face is pasted on the wall of the Sydney College of the Arts campus cafe as part of a new 20-metre mural celebrating Saudi women’s resistance. 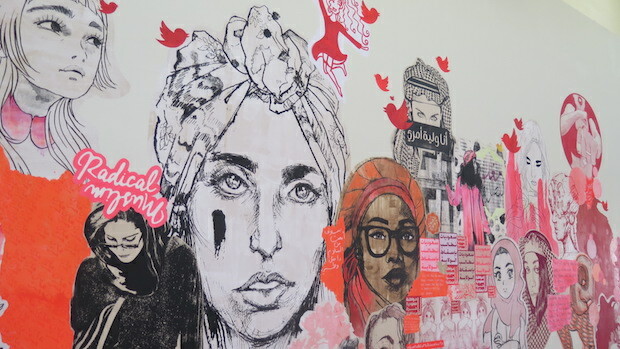 The SCA mural is comprised of paste-ups and poetry, manga figures and floral motifs, and is the collaborative effort of 30 artists from SCA, Saudia Arabia and around the world; Maryam’s portrait was drawn by Molly Crabapple, a New York artist. “I felt the movement needed some beauty, some positivity, and a different sort of expression,” Saffaa says. Included in the mural are portraits of Khadija — a Saudi woman who became paralysed from the waist down after falling off a balcony while trying to escape her abusive husband, and later passed away — and Loujain Hathloul, who was imprisoned for driving. A badge created by another woman in the movement, celebrating “365 days of persistence”, accompanies them. On the right: Maryam’s portrait, by Molly Crabapple and Ms Saffaa. The male guardianship system in Saudi Arabia enables men to control women’s lives. Women can’t renew passports, travel, marry, or leave prison without the express permission of their male guardian — either a brother, father or husband. Women’s individual experiences under this system are largely dependent on social class and the goodwill of their families. While some, like Saffaa, are able to work and study overseas, others are less fortunate. If a woman reports domestic violence under this system, it is she who ends up in a protection home, which Saffaa describes as “a jail more than anything”. “She’s not allowed to leave unless her abusive guardian picks her up. Otherwise she rots in jail for the rest of her life.”. Following the report’s release, Saudi women mobilised online. Saffaa was drawn into the fray when one of her artworks from 2012 — a piece titled ‘I Am My Own Guardian’ — was tweeted and picked up traction. She had created the artwork — a subversive portrait of a woman in a traditional male headdress — after reaching boiling point with the male guardianship system herself. While studying in Sydney on a scholarship from the Saudi government, Saffaa was repeatedly hassled with questions about where her guardian was. After ignoring their emails, one day she received a message stating that her scholarship would be taken away if she could not prove her male guardian was living with her in Australia. Saffaa describes losing her scholarship as a blessing in disguise that has enabled her to come out of her shell. While she had always sought to speak out against the government, the watchful eye of Saudi made her cautious, and she toned down her rhetoric at conferences — now that she plans on staying in Australia and no longer relies on a Saudi scholarship, her art and messages are more overtly political. The political environment Saffaa has stepped into, however, often seems doubly stacked against her. What would make this easier, it seems, is an audience willing to suspend prejudice and listen to perspectives that challenge them. Ms Saffaa’s mural is in collaboration with: @TheRealD_3, 7ala Abdullah, Allie Ballesteros, Amy Gardener, Amy StarChild, Ania // Inky, Arrietty, Wachsmann, Balqis Al Rashed, Bushra, Clancy Gibson, Evil-Science , Floor Milou Smit, Gee.Monet, Hassan Abdulaziz , Hayley Pigram, Jasper Kelly, Jessica Liang, Kelly King, Lou Young, Madeline Fountain, Miniature Malekpour, Molly Crabapple, Monsieurverde, Patrizia, Precious, RJ, Rujunko Pugh, Tamara, Armstrong, Winsome Anne, and Su سُ.